What Day Of The Week Is November 30? 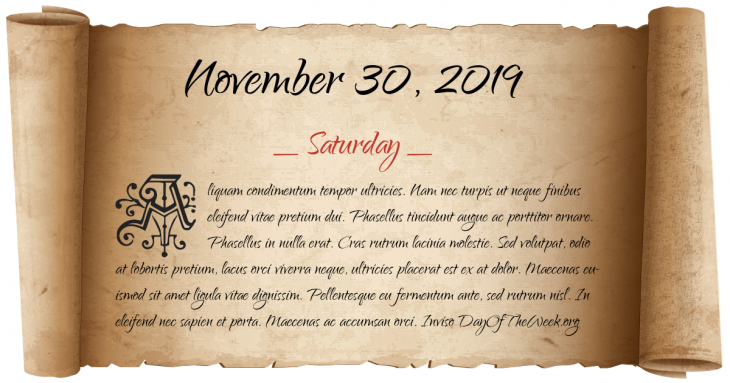 November 30, 2019 is the 334th day of the year 2019 in the Gregorian calendar. There are 31 days remaining until the end of the year. The day of the week is Saturday. Battle of Narva – A Swedish army of 8,500 men under Charles XII defeats a much larger Russian army at Narva. Peter Leopold Joseph of Habsburg-Lorraine, Grand Duke of Tuscany, promulgates a penal reform making his country the first state to abolish the death penalty. Consequently, November 30 is commemorated by 300 cities around the world as Cities for Life Day. The inauguration of a statue of King Charles XII of Sweden takes place in the King’s garden in Stockholm. Michael Jackson’s Thriller, the best-selling album of all time, is released. Who were born on November 30?